Motherwell fear Stephen Pearson could have suffered a serious knee injury in Saturday's 1-0 victory over Inverness Caledonian Thistle. 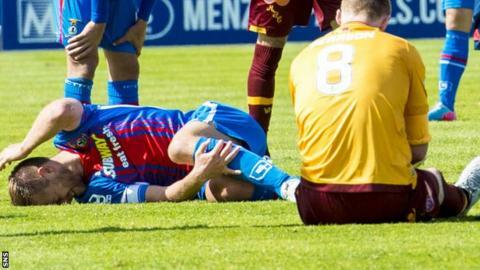 The midfielder left Caledonian Stadium on crutches following a challenge in which Caley Thistle defender Gary Warren suffered a broken ankle. Pearson, who rejoined Well in January, will have a scan this week to assess the seriousness of his own injury. The 32-year-old has made 16 appearances in his second spell at Fir Park. But, at the very least, he is likely to be doubtful for Motherwell's first home game of the season, against Dundee United, on Saturday. Pearson, who arrived from Indian Super League club Kerala Blasters, initially signed a short-term deal until the summer but in April agreed an extension until 2017. Following the incident shortly before half time in Inverness, Pearson was shown a yellow card by referee Crawford Allan and was replaced by manager Ian Baraclough at half-time.